Wil Wheaton did the voices for many of the Romulans in the 2009 movie, Star Trek. This was at the urging of Greg Grunberg, who, among other things, starred in director J.J. Abrams’ Alias TV show and briefly in Lost. Grunberg was originally also supposed to play an on-screen role in Star Trek, but was unable to do so due to a scheduling conflict. 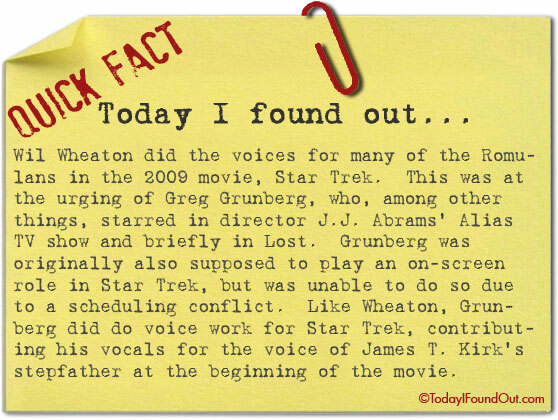 Like Wheaton, Grunberg did do voice work for Star Trek, contributing his vocals for the voice of James T. Kirk’s stepfather at the beginning of the movie.